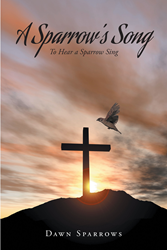 “A Sparrow’s Song: To Hear a Sparrow Sing” from Christian Faith Publishing author Dawn Sparrows is an elegant compilation of poems from the point of view of a sparrow living in God’s world, whose silent music written into the lyrical verses bring life and hope, faith and joy, to those who yearn to hear the message and the promise of God’s Kingdom. “A Sparrow’s Song: To Hear a Sparrow Sing”: a beautiful collection of lyrical, spiritual poetry. “A Sparrow’s Song: To Hear a Sparrow Sing” is the creation of published author Dawn Sparrows, a self-admitted simple and reserved person whose life has been abundantly blessed with friends and the mind-expanding treasures of travel and people. I’ve seen the music of the stars. I can capture that melody. In her book, the author presents a unique angle, the silent music of a sparrow who knows God has His eye on the little bird, offering an enduring symbol of humility and flight in the service of God. View a synopsis of “A Sparrow’s Song: To Hear a Sparrow Sing” on YouTube. Consumers can purchase “A Sparrow’s Song: To Hear a Sparrow Sing” at traditional brick & mortar bookstores, or online at Amazon.com, Apple iTunes store, or Barnes and Noble. For additional information or inquiries about “A Sparrow’s Song: To Hear a Sparrow Sing”, contact the Christian Faith Publishing media department at 866-554-0919.